Note 1: Check out my review of Ancient Stone Tablets, Chapter 2 and BS Legend of Zelda! Note 2: This game was played on an original model SNES console with S-Video cables. The console was connected to a 32-inch HD tv. You get magically transported to Hyrule 6 years after the events in the SNES classic, A Link to the Past. Quick History: BS Legend of Zelda: Ancient Stone Tablets is known as BS Zelda no Densetsu: Inishie no Sekiban in Japan. It was released in 1997, only in Japan. It was a download available on the Broadcast Satellaview, an attachment that connected to the Super Famicom (Japanese SNES). 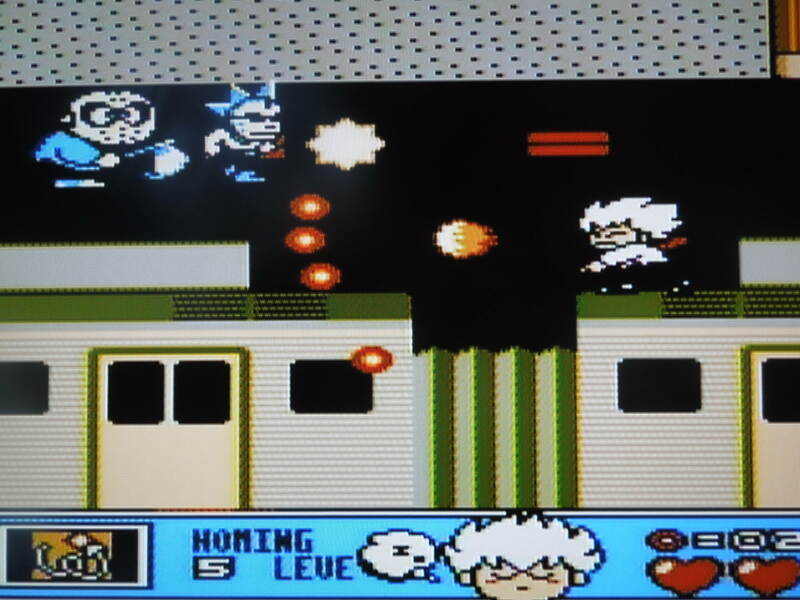 Originally, the game was split into 4 parts (or chapters), and gamers would play a different chapter on Sunday when the download became available (every Sunday, for 4 consecutive weeks). Your progress was saved at the end of each chapter and carried over to the next week, and the 4 chapters were all a part of one continuous story. Neither the full game nor individual chapters were ever made available in cartridge form in Japan or the U.S. 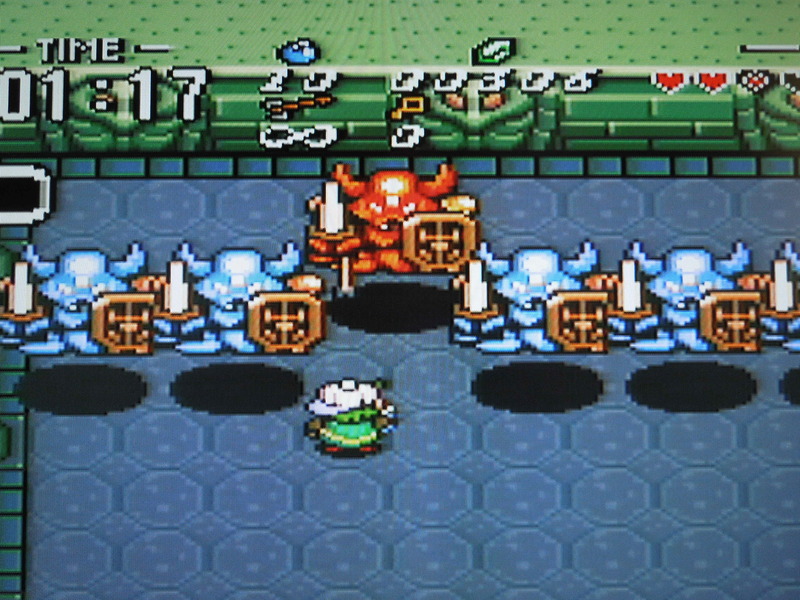 The game would have been lost forever had it not been for some ingenious Zelda enthusiasts. These gamers, from what I can gather, combined a rom of the original downloads with exact replica designs of the layouts of dungeons that had been viewed from old Japanese VCR tapes of gameplay. They created what is as close to the original game as possible. To those enthusiasts, I say, ‘Thank you.’ They translated the game, and put in a lot of hard work to make it play properly. Today, you can play the 4 separate chapters on a computer emulator and save your progress as you go along between chapters. While some SNES reproduction-makers are now able to put all 4 roms onto a single cartridge, I have each of the games on individual cartridges. This review is for SNES Legend of Zelda: Ancient Stone Tablets, Chapter 1. 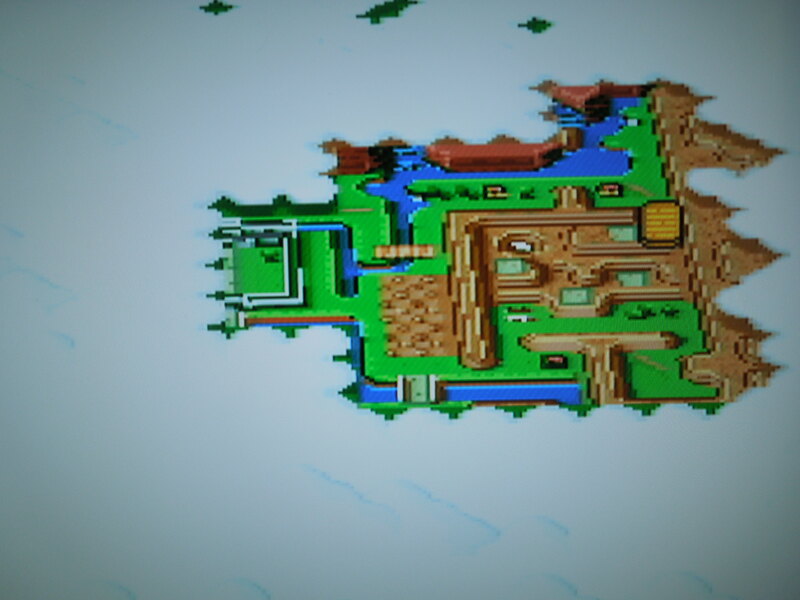 Only a small portion of the Overworld is avaliable to you in Chapter 1. You have from 1:06 to 1:56 to complete Chapter 1. Timed events, like rain, occur during particular minutes. Story: You don’t play as Link in Ancient Stone Tablets, Chapter 1. Instead, you play as a nameless Boy or Girl character – these were the ‘mascot’ characters for the Broadcast Satellaview. The Boy wears a baseball cap turned backwards. The Girl has red hair pulled back in a ponytail. The story goes that your character walked into a Fortune Teller’s tent and was transported via a beam of light to Hyrule, 6 years after the events of Zelda: A Link to the Past (if you’re familiar with that game). 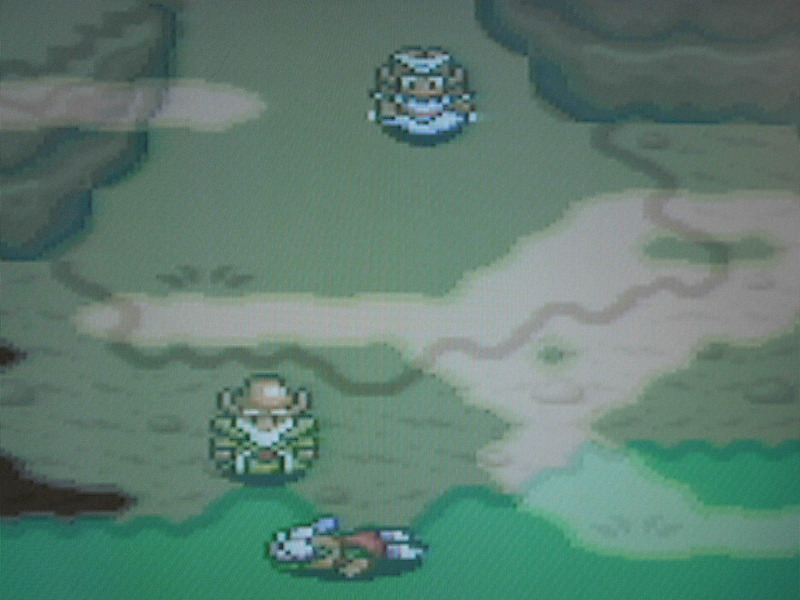 You are discovered, unconscious, by the wise man Aginah (younger brother of Sahasrala from LTTP) and Princess Zelda. Around the time you arrive, monsters start attacking Hyrule, and because Link is away on an adventure, Zelda believes you are the new Hero of Light who will protect the realm and discover why the monsters are attacking. 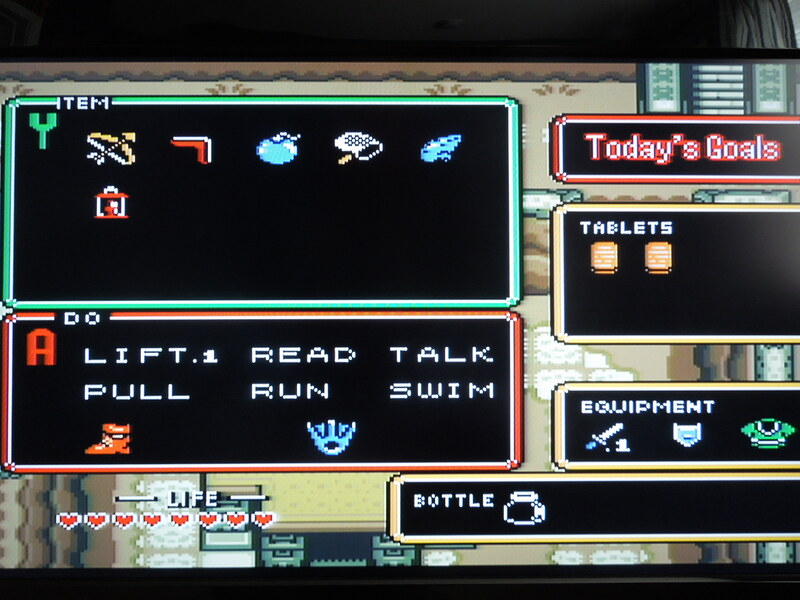 Gameplay: In Ancient Stone Tablets, Chapter 1, you have 50 minutes to beat 2 dungeons, rescue Princess Zelda, and acquire certain weapons and items. In the top left hand corner of the screen is a clock – it begins at 1:06, and it (and the game) ends at 1:56. You cannot stop this clock, even by pausing the game when you pull up the item menu – keep this in mind when you start playing this game. You awaken in the ‘secret hideout’ of Aginah, and that is where your adventure begins. 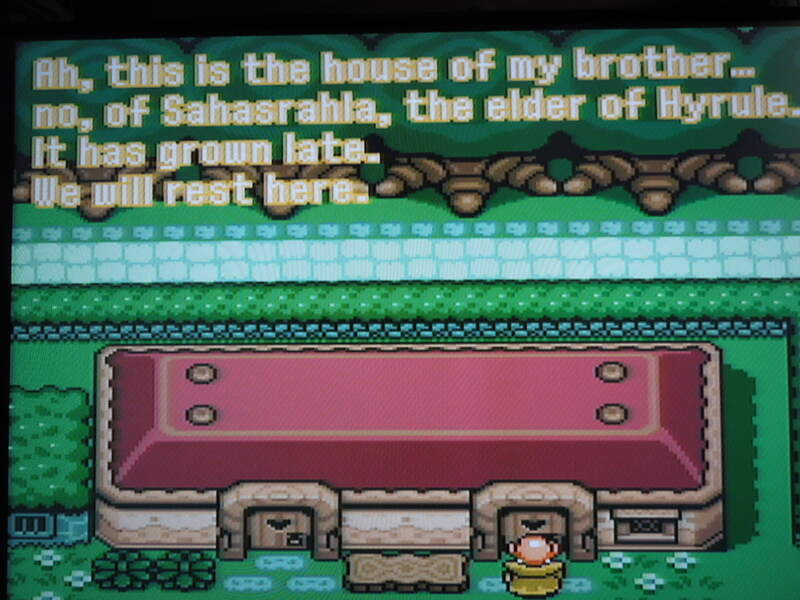 The original Broadcast Satellaview download of Chapter 1 had live voice actors (playing the role of Aginah, Zelda, and a Fortune Teller) who would tell you (in Japanese) where to go at certain times in your 50 minute play session, and they gave you hints. Because that wasn’t possible to re-create, the Zelda enthusiasts who worked on this game translated the script of these voice actors, and it appears as on-screen text at the bottom of the screen during gameplay. Certain events happen at certain times during gameplay. For example, faeries appear on screen at 1:10. 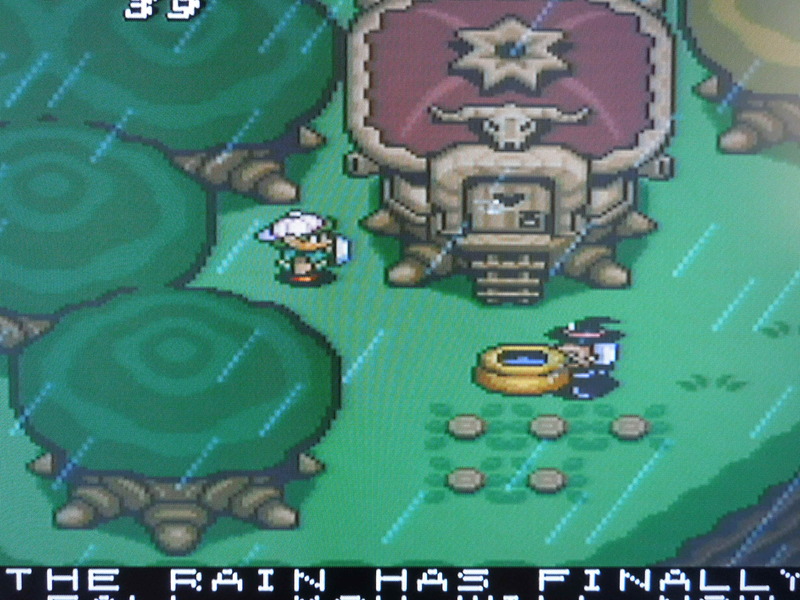 It starts raining in the Overworld at 1:23. Pressing Start, then pressing R pulls up Chapter 1’s goals – here you’ll see everything you need to accomplish in your 50 minutes of play. Use the bow & arrows on the first dungeon’s boss for a quick win. Control: If you’ve ever played Zelda: A Link to the Past for the SNES, this game uses the same control scheme. B swings your sword. Y uses your alternate item (like your bow & arrow or lamp). A dashes once you have the Pegasus Shoes. X opens up the Overworld map or Dungeon map. Start pulls up your menu in order for you to change your alternate items. Pressing R while in the menu pulls up the Week’s (Chapter’s) Goals, showing you everything you are expected to acquire or accomplish during your 50 minutes. You have to find 2 Ancient Stone Tablets in Chapter 1. High Score: This game, in Japan, was originally intended as a type of high score game, in addition to just an adventure game. You get a certain number of points towards your ‘Score’ (viewable by pressing Start on your menu screen) for opening treasure chests, defeating the 2 bosses in the 2 dungeons, collecting heart pieces, and rescuing Zelda and returning her to the castle, among a few other things. 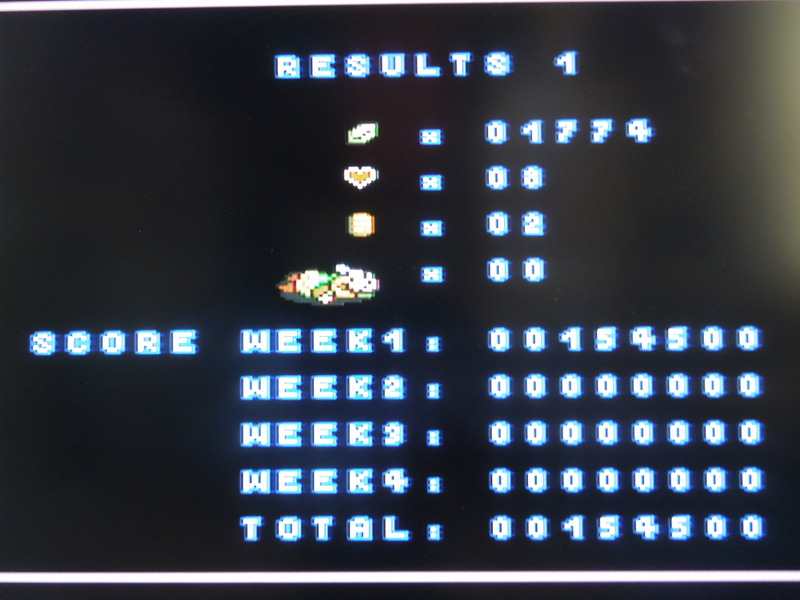 When the clock reaches 1:56, after the ending plays, you’ll see a high score screen with your total for ‘Week 1’ (Chapter 1). XL Bag: At the beginning of the game, Aginah gives you the XL bag, which contains the Net, a Bottle, the Lamp, and the Ocarina. The Ocarina can be played on the Overworld to transport you between the 2 dungeons and the Magic Shop. Within the dungeons, the Ocarina will transport you back to the entrance. Autosave: The cartridge ‘autosaves’ your game. If you turn off the power or reset the game in the middle of gameplay, your progress will automatically be saved to the exact minute where you were. Rent the level 2 sword or the shovel (used to dig up a heart piece) for 100 rupees – both good for only 10 minutes. 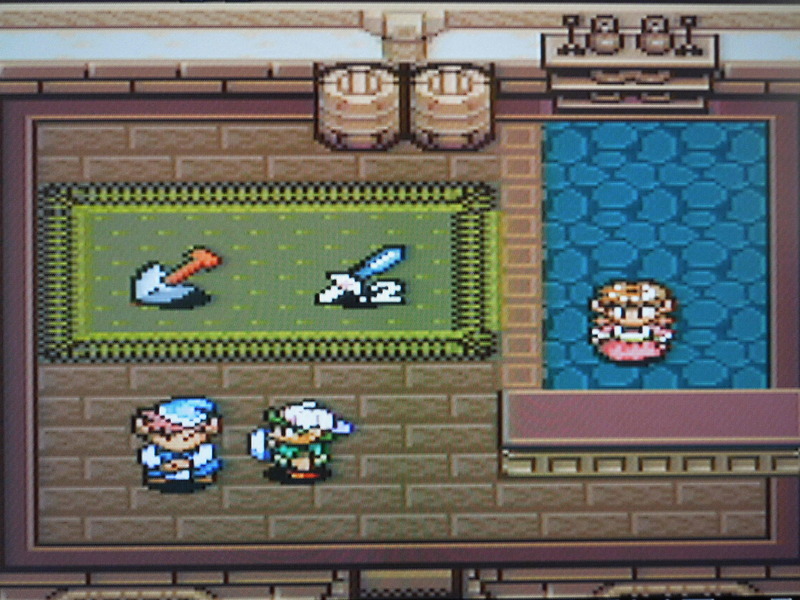 Sound & Music: I’m not sure if it was part of the original Broadcast Satellaview game, but all of the music in this game comes from the popular and well-known SNES game, Zelda: A Link to the Past. The music is excellent, as are the sound effects. Wait, so the entire game is only 50 minutes? I don’t quite understand. Yes, BS Zelda: Ancient Stone Tablets, Chapter 1 is only 50 minutes, and represents only 25% of the original game. Originally, you would save your progress at the end of Chapter 1, and it would be carried over into Chapter 2, where a new section of the Overworld map would become open to you, 2 new dungeons would be available for you to explore, and the story would continue. The same would happen with Chapter 3 and Chapter 4. This game cartridge, however, is only for Chapter 1. You are only able to explore a certain portion of the Overworld map (rocks or other obstacles prevent you from going further). You are only able to explore the first 2 dungeons and collect the first 2 pieces (of 8) of the Ancient Stone Tablets. You only begin to unravel the mystery of why you’re in Hyrule, what the Tablets mean, and why the monsters are attacking. 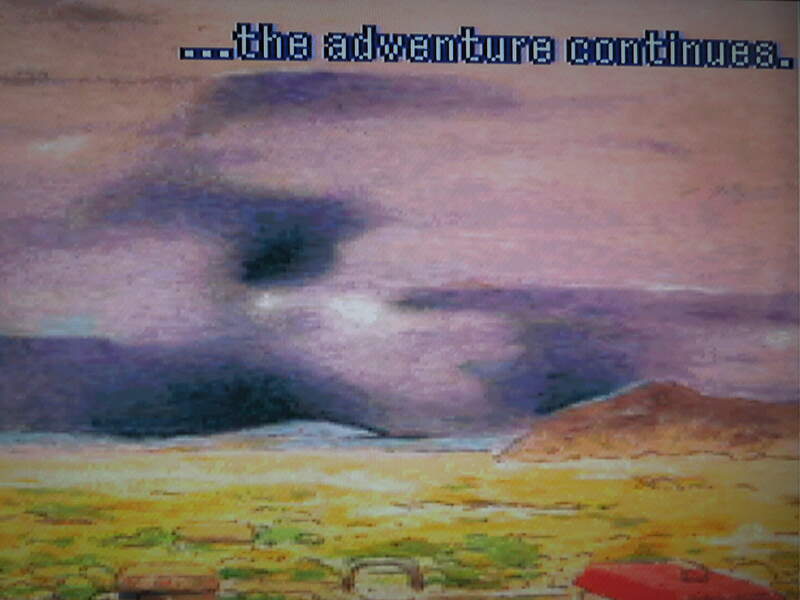 In essence, unless you play the other 3 chapters (which are possible to play on SNES cartridges, even without having ‘saved’ progress from Chapter 1 – more on this later), you have to view this game as a microcosm, and its ending is the proverbial cliff-hanger. Barriers prevent you from exploring any more of the Overworld than Chapter 1 is designed for. Goals: In Chapter 1, these are your objectives: Defeat the 2 dungeons and obtain the first 2 stone tablets. Gain 4 heart containers (2 from defeating the dungeon’s bosses, 2 from gathering 8 separate heart pieces hidden throughout the game). 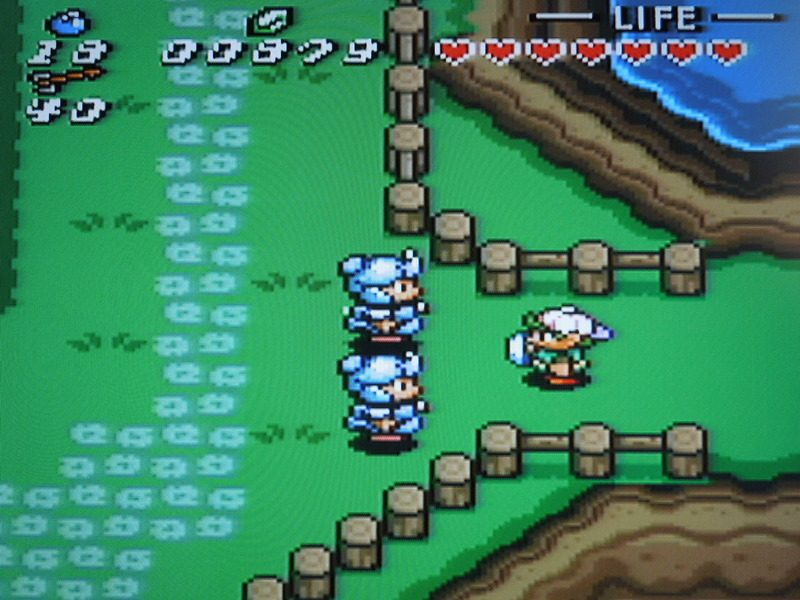 Obtain the Sword, Shield, Flippers, Pegasus Shoes, Bow & Arrows, and Boomerang. Oh, and be sure to rescue Princess Zelda, find the Mole character, and play the Pot-Smashing game (all optional). So, where can I find this game? Some SNES reproduction websites can create Legend of Zelda: Ancient Stone Tablets, Chapter 1 for you, and some even have all 4 chapters on a single cartridge. You can also play the game on a computer emulator. The game ends with a cliffhanger, and the mystery of the Ancient Stone Tablets just beginning. Your score is presented at the end of the game. Similarities to Zelda: A Link to the Past: This game is not a re-make of A Link to the Past, as the story clearly sets Ancient Stone Tablets 6 years after the events of that game. However, because it is set in the same world, locations in both games are essentially found in the same place. There are additions to the Overworld made in Ancient Stone Tablets. Other changes were made as well. Here’s the best one: The Pegasus Shoes’ function has been altered in Ancient Stone Tablets – you can now dash non-stop in all directions. You can turn on a dime, and this makes traversing the Overworld and dungeons much faster. Conclusion: I’ve watched videos of the original downloaded version of Ancient Stone Tablets from Japan in 1997. Those who made this game available for play did an amazing job making this game as close to the original as possible. 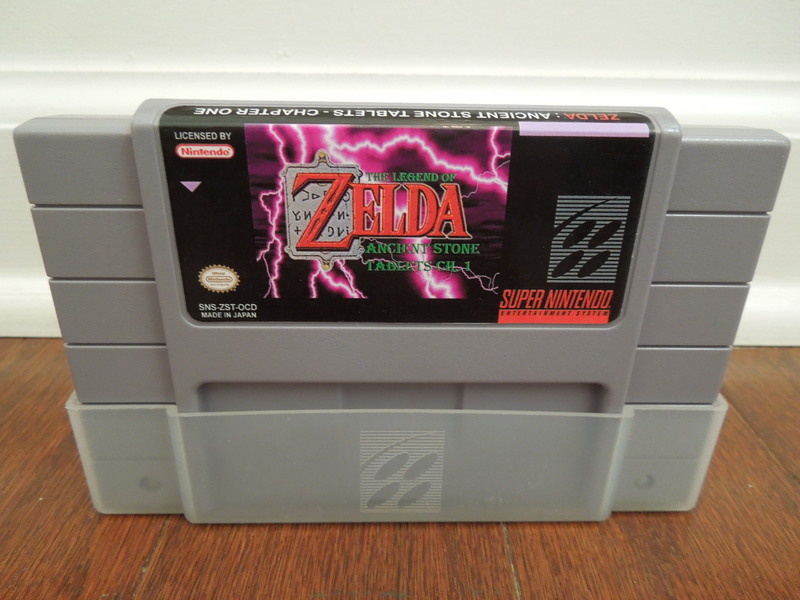 What is great about this game is that it is an original Zelda game, undiscovered by many Zelda fans. Ancient Stone Tablets: Chapter 1 is very easy, also. The 2 dungeons in the game are quite simple, and you shouldn’t have any trouble beating the game without losing a life. Trying to get a high score in the game adds replayability. However, because this cartridge represents only 25% of a larger game, you’ll want to continue after you’ve beaten it, but sadly, that’s the end of the game on this SNES cartridge. Chapter 1 ends with many questions left unanswered. 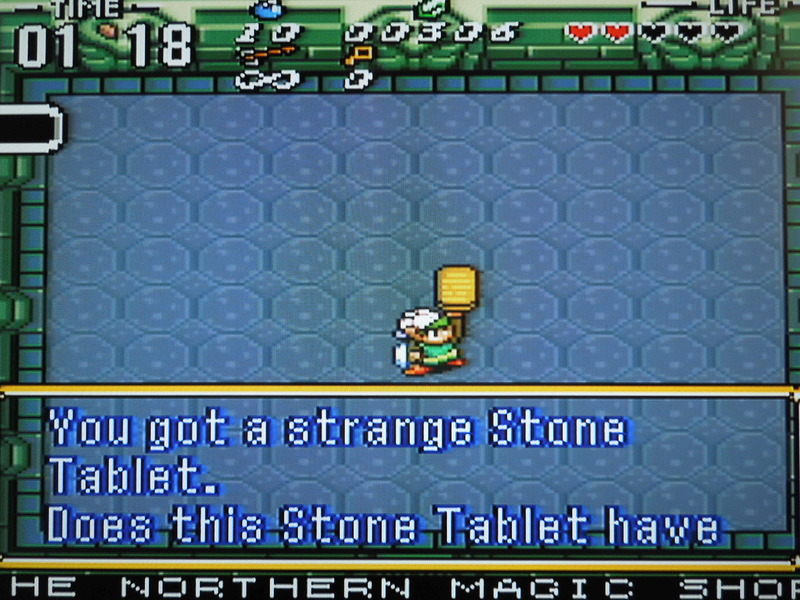 This entry was posted in SNES - BS Legend of Zelda: Ancient Stone Tablets, Chapter 1 and tagged BS Legend of Zelda: Ancient Stone Tablets, Chapter 1 Review (SNES). Bookmark the permalink.